A few weeks ago I was reminded just why I love the blogging community on Twitter. I wrote a post, The Girl That Lied, and the support I received for this was so overwhelming that I cried. My post was shared & shared, I feel like every second notification was someone sharing it which at first made me extremely nervous, but the kind words that came from these people had me tearing up. They showed me that there really is good in the world & that there are those out there who know how to build each other up instead of tearing each other down. I received messages from people I had never spoken to before and now talk to on a regular basis. People sent me tweets saying how much they admired my strength and courage, you have no idea how much these words have stuck in my mind. When I'm feeling down I remember these people, their kind world's will stay in my heart forever. 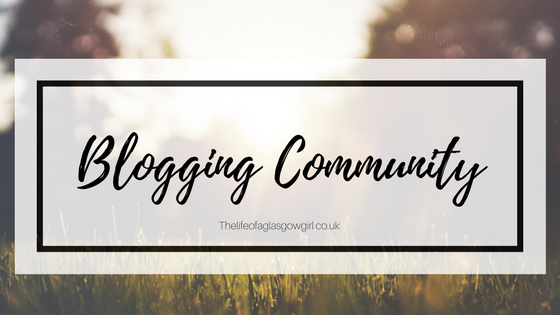 The blogging community gets a lot of flack sometimes, with posts being written about how there's no support anymore and it's a dog eat dog society. But I have received nothing but amazing support from it, through so many things, not just this post. When another blogger attacked me as a mother, bloggers gathers around me and lifted my spirits again. When a blogger had the audacity to speak of my son in a blog post, bloggers came to my side. When I received hate from another blogger, spreading lies and rumours about the kind of person I am and making up "facts" about me in a blog post about the blogging community, bloggers stood with me. For every one rude, immature person out there spreading hate and causing drama, there's about 1000 more who are there, ready, willing to support and help out. These girls/guys who rallied beside me, who have lifted my spirits and shown me that support really is still out there, they will never know just how grateful I am, not only for their kind and heart warming words, but for the fact there's still some good in the world. I always try my best to help others so it's amazing to know there are people out there willing to help me in my dark times. The blogging community is amazing, I urge people who feel like they can't make friends online or haven't been feeling the love to reach out, join chats, spark up conversations with others because trust me, there are people out there who will welcome you with open arms and show you the love in the community. I completely share your love for the blogging community, Jordanne! It feels amazing to have such support, especially from people on the Internet who have no obligation to be there for you! I would also urge people to get involved with the blogging community, I've made so many friends here! Absolutely love this!bloggers should support each other! The fact so many people stick together is awesome it's such a great community! Loved this! I've only had my blog for a couple of weeks but in this time I've really tried to get involved in twitter chats etc and everyone has been so welcoming and friendly! Definitely a very special community to be a part of! This is so lovely! I'll never understand why so many bloggers have the need to tear eachother down when so many others spend their time building eachother up! When I started blogging, I knew nothing of the community that comes with it. But, now I couldn't live without them. The blogging community has given me some amazing friends and that, I am thankful for. I definitely agree with your love for it. The community surrounding blogging makes it so much more enjoyable. There are times when it's gotten too much for me and I've wanted to quit but the support from others pushed me to keep going. This post is lovely! I'm so glad the blogging community have supported you in such a rewarding way - the constant love between bloggers is just one of the many things that makes blogging so wonderful! Glad you're feeling okay now. The blogging community is great and there's so many supportive people around! I'm so happy with the response you got for your post, Jordanne! Also I agree with you about the love for the blogging community, it's nice we have each other's backs! I completely agree with you lovely! Everyone is soo supportive it is amazing to see it. It's one night happy family, I know if I need anything, I'll speak to a blogger. I'm really glad you've got a good community around youu. It helps you to push forward from the negatively. Love this post, I've only been in the community a very short time, but this is so, so accurate! Very nicely put! It's unfortunate that this happened to you but It is truly amazing how to blogging community comes together to help when someone is in need, particularly The Girl Gang, they're a fantastic bunch of people. Fab post. Good you have received some support from the community. The community is one of the best things about blogging. It's so nice to know that even though there are the few trolls out there, the number of good, uplifting people is so much higher. I'm sorry people were cruel to you. There is no excuse for that.